✪ 购 购 购 购 购 购 购 购 购 购 购 购 购 购 购 购 购 购 购 购 ✪This product is a personal hygiene product, and it is sold without returning goods. (瑕疵Not in this range) ✪竹子 is a natural bamboo, bamboo has both its bamboo and bamboo spots, no chemical processing bleaching agents, unacceptable, please do not place an order If you need to customize laser engraving, please go to https://www.pinkoi.com/product/2StaACny?category=5 Fill in the quantity, and when you check out, write the text you want to customize in the Remarks column. 元Yuantai Bamboo Art Co., located in Zhushan Town, Nantou County, developed the Yuanqi Bamboo Toothbrush before the factory collapsed. In the past two years, it has been supported by many friends from Taiwan and has been able to smoothly transform. Now we must solemnly launch the “anti-disposal petrochemical products”. The second bomb -**vitality bamboo straw** ✪元气竹吸管 According to the data of the Plastics Industry Technology Development Center, Taiwan currently uses 3 billion plastic straws per year. With an 18cm straw, it can circulate 13.5 laps around the earth. This is just Taiwan... watching the soil grow out. 100% decomposable straws, after two years of testing and material search, accumulated tens of thousands of experience, only this bamboo straw. ✪ production process High temperature carbonization, hand cutting, sanding, and removing bamboo film. ✪Dimensions Children's straw / 12cm, household straw / 15cm, standard straw / 21cm, Boba straw / 21cm (inner diameter: 10mm or more), special straw / 25cm, horse hair straw brush / 21cm, accompanying embryo cover. **Use Q&A** **Q: How to clean the bamboo straw? ** A: It is recommended to clean immediately after use. For example, drinking coffee and heavy-duty drinks, or beverages containing dairy products, it is recommended to clean with a straw brush before washing. **Q: How to keep it dry? ** A: Generally, just place it in a ventilated place and let the straw dry naturally. **Q: Can the bamboo straw be placed in the washing and drying machine? ** A: Can not be placed in the dishwasher, can be placed in the drying machine. It can also be sterilized by boiling water. **Q: Does the bamboo straw absorb the taste? ** A: In fact, only need to use a brush to rinse with water a few times, the taste will fade. **Q: Will the bamboo straw be moldy? ** A: The bamboo straw has a bamboo shell inside, so it is not easy to mold in the wall. However, because the capillary is exposed at both ends of the slit, it is easy to have moisture adsorption. It is not easy to mold when used frequently. Once the mold is found, only a knife is needed. Cutting or sanding the mold to the moldy part, the hot water can be used continuously after being sterilized. **Q: Do you have to use a straw to drink? ** A: Not necessarily. The vitality bamboo straw is not to encourage people who do not need a straw to start using a straw, but to provide a person who wants to use a straw or a straw to solve some troublesome people, or even a person who wants to enjoy the joy of hand-shake and drink. The choice of disposable plastic straws. We met some friends who are worried about the earth and urged everyone not to use straws. But for Yuantai Bamboo Art, this is like the different cultures of dining, some with hands, some with knives and forks, and some with chopsticks. 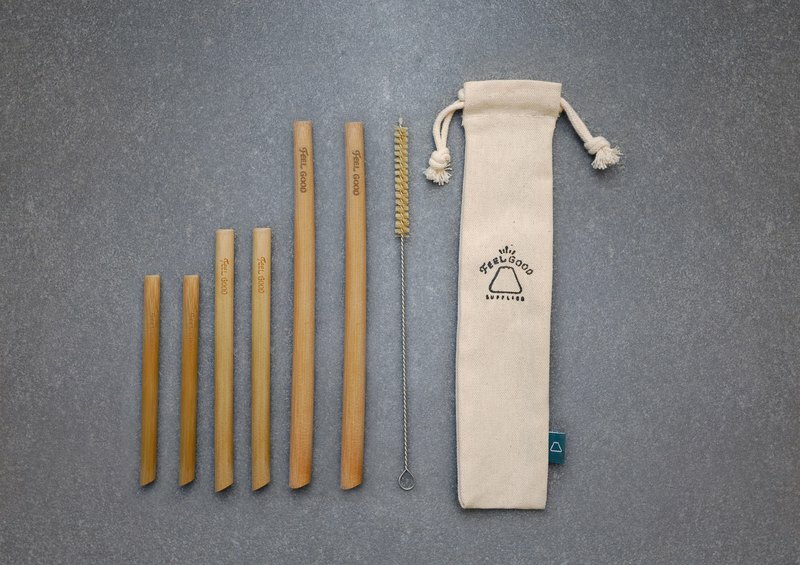 It's all a choice in life; it's just that nowadays disposable plastic products are not very good for the earth and for ourselves, so we invite you to consider using the perpetual circulation of the vitality bamboo straw!